The sister city relationship between Arlington, Texas and Bad Königshofen in Bavaria began when a German official on an exchange program stopped in Arlington and related how hard things were in his city. Not only were they suffering from post-war shortages, but their location on the border created an influx of refugees from the East which also strained their resources. The Texans quickly gathered supplies and had them shipped to their new German friends. Over the ensuing 50 years the relationship grew. 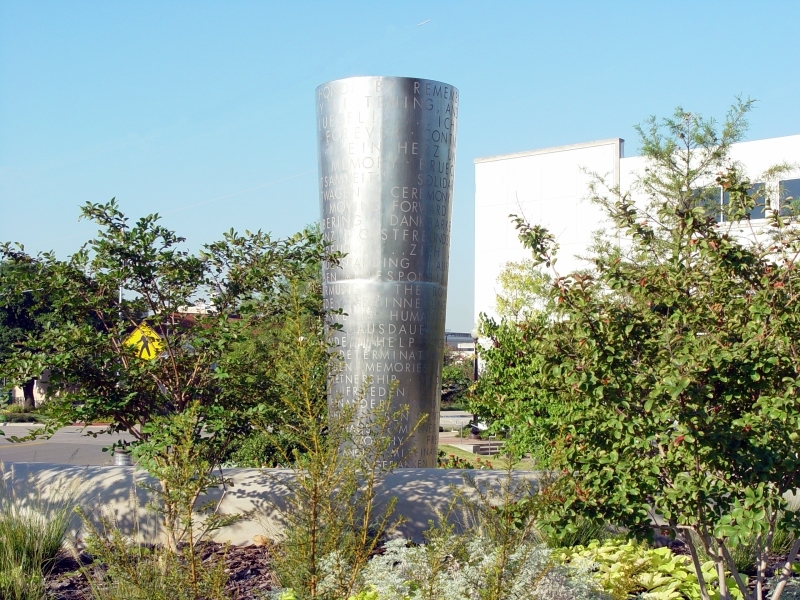 In 2003 Arlington installed this 12-foot stainless steel pillar, etched with words in both German and English that reflect the depth of the relationship. It was designed by a team of Texan and German artists and stands in a small park at the city’s art museum, across the street from city hall. A polished stone slab is engraved: International Peace and Friendship Monument | Dedicated July 12, 2003 | In honor of over 50 years of friendship between Arlington and Bad Koenigshoefen.